Penrhyn house is situated in the seaside resort of Penrhyn Bay close to the little orme, between the Victorian seaside resort of Llandudno and Rhos on Sea, with local shops, restaurants and amenities a short distance to the village of Penrhyn Bay. Penrhyn House is a most attractive detached large family four bedroomed house set within good sized front and rear gardens with a block paved drive and ample parking for up to 4 vehicles. The rear garden has a large garden and patio area equipped with garden furniture, barbeque and night lighting for summer alfresco dining. The property is also gated for privacy. Penrhyn House is the perfect choice for families or groups of friends wanting to get together in tasteful surroundings. In a great location to take advantage of everything that the North Wales Coast has to offer, or simply a place to just relax and unwind. 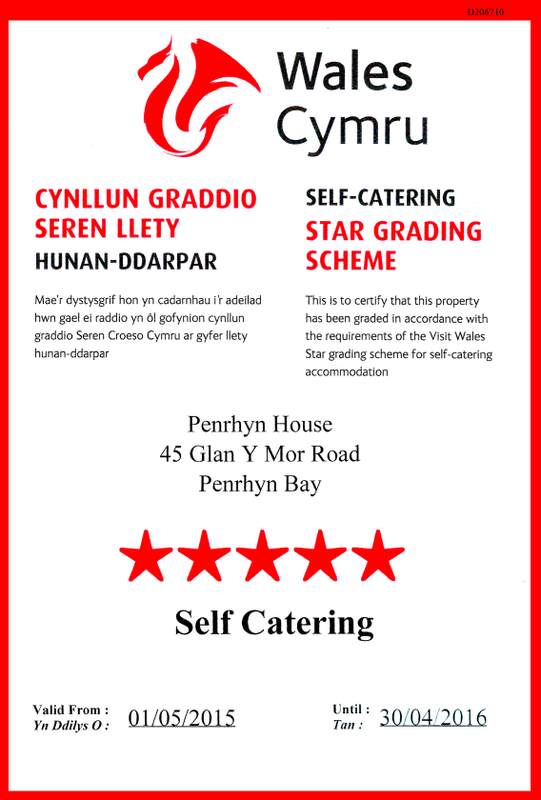 Penrhyn House has been awarded a coveted ‘5 Stars’ by Visit Wales.